The only problem with writing a blog is you have to remember to write it! Sarah and I have made many a trip since my last missive so I thought I would break it up and share with you our trip to see the folks…..Norfolk and Suffolk. Some of you readers, I think there are three of you, will remember that Sarah, my beloved wife and sharer of my coffee adventures, harkens from the land of Ed Sheeran, Laura Wright, the Suffolk Soprano; June Brown, (or Dot Cotton as most of us know her), and Lord Voldemort himself, Ralph Fiennes. Sometimes we get the urge to be near the sea, the sunny sea and the sky, I left my vest and socks there…..I wonder if they’re dry. (thanks Spike Milligan, your best poem ever!). So, with the urge upon us we first went to Orford. Our aim, being members of the National Trust, was to visit Orford Ness. Now here’s the thing, we actually left our home in Dunstable at about 12…ish. It takes, with the wind behind us, a couple of hours and I think we were about twenty minutes away when Sarah, who had been perusing the NT guide said…..oh…….then there was a pause…….it’s closed!! As I pulled into the car park I thanked my lucky stars it looked very pretty. We walked along the banks of the River Ore, in an area almost seemingly untouched by the modern world, although it still charged us for parking so not that untouched, and I’m going to be honest, I fell in love. My friends will know that if I really like somewhere, I say I am going to buy a house there. I wanted to buy a street here. I felt calm and at peace and when Sarah and I sat and eat our picnic, (yes, that day we were organised), we watched families play in the sand / silt / mud, we heard the laughter of the village elders as Sally, (not her real name), made farting noise that sounded like the backfiring of a Sherman tank and drank in the scenery, we knew one thing, and one thing only, was missing……..coffee!! We walked to the Riverside Tearoom and watched locals work on their sailing boats. The tearooms has a decking overlooking the river and here we rested…again. I ordered my obligatory cappuccino, (with caffeine!!) and Sarah had tea. We shared a coffee and walnut cake and just chatted. The cake was a bit dry but the coffee was greatly welcomed. Would I recommend coming here? Oh yes! It’s not one for kids and anyone who wants excitement but just to relax, it’s a good choice. Our next foray was north to Norfolk. I had never been to Brancaster before and I am so glad I did. My sisters-in-law love it there and I can see why. Sarah and I walked along the beach with the wind whipping quite excitedly behind us. One of the little quirks that Sarah has is that she doesn’t like walking back on herself when we are out for walks so we do a lot of circular walks. This day, I really wish we had stuck to that. There was no way of doing it without checking out the entire North Norfolk coast so we turned round. That excited wind I just mentioned went ballistic. Like Lawrence of Arabia, I battled forth, (I know Sarah did as well but this is all about me), into the eye of the storm. The sand devils blew around us, picking up seaweed, shells and small puppies, (poetic licence), and I remember thinking, I may leave this place, with rugged lines upon my face and tousled hair. Obviously being bald, ginger and pretty much translucent, I could only pretend that was how I now looked. The mirror in the gents told me I was just red!! We leapt into the car and drove to Hunstanton, slightly Southwest of Brancaster. We parked in the town and just walked. As long as you ignore the “kiss me quick” bit, unless you like that sort of thing, it too is worth a visit. We heard the band play in the pavilion, Sarah won a fiver in the 2-penny pusher in the amusements and we had fish and chips. The siren sang her song and we eventually found ourselves in Beccas Kitchen. It may have been a bad day, I don’t know, but the coffee was so strong, even I couldn’t drink it and the cake was dry and although we shared it between us, we couldn’t finish it. Based on that visit, would I recommend it, perhaps not but maybe, on another day, it might be worth it. I give it 1 coffee and only because I can’t give it a zero. I know there was at least one toilet and it was wheelchair accessible so not all bad. From Tintagel to Thailand and from Phuket to Pembrokeshire. It has been a while a since I last put pen to paper or keystroke to computer or whatever. Since our trip to Chester, Sarah and I have been out and about and have tried to live life to the full. We love our home and wherever we go, and for however long we are away, home calls to us. Recently we had a lot of work done to the house, Garage conversion, a porch type thing and a bigger downstairs toilet, (the room, not the actual toilet. That would be bizarre). Those of you who know what building work does to your house and mind, you know getting away is always a good thing. It was a wild night, with waves crashing on the Cornish rocks and sea spray drenching the two men standing by an oak door seemingly part of the cliffs themselves. In the castle, Ygrayne sat by the fire waiting for her husband, Gorlois, a brutish man prone to violent tempers and Uther Pendragon’s friend. Candlelight threw shadows on the walls, shadows that would make a weaker woman shake. Suddenly, the vast oak doors of the hall burst open and Gorlois strode in, drenched from head to foot. He threw his cloak to a waiting servant, shouting for him to leave. He pulled Ygrayne to him, looking into her eyes, almost looking into her soul, smiled and….. So, back to the present time. What is left of Tintagel Castle sits on the headland of Tintagel Island, adjacent to the village of Tintagel and is looked after by the English Heritage, @EHTintagel. It wasn’t there when Arthur was born but there was a settlement. It is an amazing view both from the Castle and the headland and the most beautiful statue of Gallos stands guard. That day, Sarah and I got more than our 11,000 steps in and walking to and from the castle meant refreshments were in order. We stopped off at Pengenna Tea rooms. It was very well decorated and the staff greeted us warmly; hardly surprising as we were the only people in there! To be fair, it was early and the weather was very Cornish so most tourists would probably still be tucked up in their hotel rooms. The coffee was nice but pretty standard. We did have a scone with jam and cream to go with it and that was lovely and huge. The toilets were clean and wheelchair accessible so I would thoroughly recommend Pengenna’s. The main menu was enticing but we had to carry on our journey to visit our number 2 son, Joseph. Those pesky kids!!! Our next visit is to Thailand and the wonderful island of Phuket. We were there for my beautiful niece’s wedding. If you don’t know, Thailand is incredible and the people we encountered were friendly and helpful and you must believe the guidebooks…..they love to smile. We were there for two weeks with glorious sunshine, an amazing private villa for the 1st week and a lovely 3-star hotel for the 2nd week. My 1st son, Sam, got a day of diving, his one true love, number 2 son proposed to his lovely Hannah and the rest of us got burnt!! We visited the Big Buddha, and three other Buddhist temples and then Sarah wanted to visit Phuket Old Town. Amazingly, we had, at the bottom of the hill leading up to our hotel, a taxi rank, (I actually think all of Kamala was a taxi rank), and we literally had a driver for two days….amazing! He drove us to places that were off the beaten track including a temple we would never have found and Phuket Old Town. We sauntered leisurely, (that’s me trying to be all poetic again! ), and had lunch in a restaurant that was family owned and in order to use the toilets, we had to walk through the kitchen…..it was brilliant. And, it was one of the best bathrooms we found during our stay there. Some were, let me just say, interesting. Phuket Old Town harkens back to the old Portuguese Colonial days and has some fabulous architecture. Of course, it really doesn’t matter where I am. If there is a coffee shop, we’ll find it and we found “Coffs and Burgh”. This was a harmonious blend of coffee shop, art shop, music shop and Emporium of stuff, as the photo’s will attest. oh, and the top of Emily’s head! But, and this is important, let it not be said that we lack culture….modern culture that is! Here is my son and daughter blending in with the locals and yes, we did stop for a burger! My last visit, (sorry, this is a long one this time but at least I will have caught up), was to Wales. The kids bought us a Farm B&B stay and we chose a nice place called Green Grove in Robeston Wathen, Narbeth in Pembrokeshire. Sadie runs the B&B and her husband Nigel is a joiner, as well as a farmer. I wonder if they would have stayed solely as farmers if the Welsh Government had not compulsory purchased a chunk of their land to run a bypass through! It has old décor and our room, with the only en-suite, had the smallest TV of modern times. Still, it was big enough to see us do very badly in the Eurovision! We were greeted warmly and with a tea, a coffee, (Shocker) and warm Welsh cakes…..yum. Breakfasts were enough to fill me up and if you have never been to Pembrokeshire, like we hadn’t, get there and you will not be disappointed. The scenery is stunning, the beaches so clean and definitely much cleaner than the post Bank holiday at Southend, and the people so friendly it shocks us that we have not been there before. The weather was incredible and we visited places like St David, the smallest City in the UK and only because it has a Cathedral. It was a tiny village really but beautiful, nonetheless. It was here, after a walk around the old Bishop’s Palace and the Cathedral, that we found our first jewel. Pebbles Yard Gallery and Espresso Bar is on the Pebbles leading down to the Cathedral. Downstairs is a gallery and a small espresso bar serving just coffee and tea. Upstairs is a slightly bigger café area with a few tables and a little, hard to get to, tiny toilet. We had the obligatory tea and cappuccino and two slices of cake, a lemon drizzle cake and a coffee cake. The drinks were fine but nothing special and cakes were a little on the dry side. All in all, a pleasant place to stop and maybe we got the cakes on a bad day. I give it a one for coffee, and whilst it was pokey, it was clean and providing you could get up the stairs, so not wheelchair accessible, it was a toilet! Our last stop, you’ll be pleased to know, was on the way home in beautiful Tenby. The beaches have to be seen to be believed. Tenby is actually known, in Welsh, as Dinbych-y-pysgod, meaning Fortlet of the fish. I had to ask my friend Llew what it meant and he could only translate the fish bit……been in England too long I think! It is a walled city and we must go back there. As everywhere else, the people were lovely. We found a coffee shop in a back street and we are so glad we stopped. I wasn’t actually going to blog about it but once I tasted the coffee and used the bathroom, (very clean, very nice but only one toilet), it was a must. The Fuschia Caffe was staffed by a group of young but very hard working lads and ladies and as you can see, Sarah felt very much at home. I suppose my only quibble was at the end of the alley / back street, was a bar and there were three blokes outside, who obviously worked there or people just really liked their company t-shirts, and were smoking. We couldn’t smell it so I should just stop moaning. We had to have farewell welsh cakes but they weren’t warm so they’re just lucky I don’t do scores for food, that’s all I can say. A nice stop and prepared me for the drive home. I urge you to try some of the places we visit and I also urge you to spread the word about my blog. I will improve it as time goes on and add more features but I am just learning. I really enjoy doing this and would appreciate your support on social media, (I really just want to visit beautiful places and drink coffee for a living!!!). Thank you everyone. Author the1stcoffeehousePosted on May 15, 2018 2 Comments on From Tintagel to Thailand and from Phuket to Pembrokeshire. I think people often forget how beautiful and amazing our island is. That goes for the British public as well. All we ever hear about in the news is bad stuff. National and international news focuses on loss and devastation, even local news most of the time. When Sarah and I lived in Guernsey we laughed when the local news reported that Geoffrey the cat, (names have been changed to protect the innocent), has been found and reunited with it’s owner. Now, I and I suspect most people, long for those halcyon days. We decided to spend a weekend in Chester and then on to my sister-in-laws for the evening. Chester is beautiful and we walked the full 2-miles of City wall, the most complete in the UK, that has been there since the Roman Occupation. There were some ups and downs, literally, and some reinforced sections boast the back of shops and various buildings but none-the-less, most of the views are wonderful. You get to see the Roodee, which is the oldest “still in use” racecourse in the country but as we got to the end of our walk, just past the 1000-year-old cathedral, the urge hit me!!! I know my aim is to find individual coffee houses, not chains, but Beatons, in Bell Tower House, on bell tower walk (chester@beatonstearooms), just impressed me. I look for great coffee but also great service and atmosphere and this had it all. This was the sign that greeted us, followed by the owner who has had the franchise for 3 years and sticks to the company’s ethos that customers are their “raison de vivre”. Their menu was very nice, particularly the coffee section and the cake, I think that had pumpkin, or courgettes or something but it was very nice, moist and more importantly, gone in about 1 minute. I spoke with the owner and she was just very nice. All in all, part of a very pleasant visit and just one of the cafés we visited. The 700-year-old Rows are literally rows and rows of shops on a few levels and this was where we stopped for lunch. I would just like to point out that there was other stuff going on in-between but the account has been edited for rapid consumption. Should you wish the full story, please send me a cheque for £19.95 and the entire 632 pages are yours!!! The Rows Café was on the 1st floor and really quite, as the Americans would say, quaint. We had the obligatory Coffee and Sarah had a Diet coke. The cheese and onion toasties were very welcomed but the coffee was not quite up to the standard of a McDonalds Cappuccino. Another down side was no toilet. The great find though was Bollands next door. Look at that collection of coffees, including the expensive Kopi Luwak that is, as http://www.coffeedetective.com states, sweet, smooth and with a hint of chocolate. For those who are not in the know, this is coffee straight out of a cats a@~e!!!! If you don’t understand what I am referring to, Kopi Luwak or civet coffee is the world’s most expensive and low-production variety of coffee. It is made from the beans of coffee berries which have been eaten by the Asian Palm Civet and other related civets, then passed through its digestive tract. A civet eats the berries for their fleshy pulp. In the digestive tract, the civets’ proteolytic enzymes seep into the beans, making shorter peptides and more free amino acids. Passing through a civet’s intestines the beans are then defecated, keeping their shape. After gathering, thorough washing, sun drying, light roasting and brewing, these beans yield an aromatic coffee with much less bitterness. (https://www.coffeebeanshop.co.uk/kopi-luwak-p-481.html). I did think about buying a 100grams and then thought……yeah right but I did buy 100 grams of a nice little Old Brown Java and a Sumatran Decaff. All in all, a great weekend and I highly recommend Chester. For toilets just Beatons I’m afraid. People who think they know me may not realise but I can be a bit spontaneous. For example, one day I decided to accompany my then best friend to the RAF recruitment office. He wanted to be a pilot. I had every intention of staying on at college, completing my science courses and eventually becoming a Forensic Pathologist. He left with his tail between his legs. I left with an appointment for a medical, which eventually led to a less than illustrious 10-day military career!! Another time, at about 10am on a Sunday morning I woke up and decided we, as a family, should drive to Sherwood Forest and have a look at the supposed haunts of one of my childhood heroes. It took us more than two hours to get there, we had a walk and a quick look at the Major Oak, had a cuppa with a scone and tons of cream and then drove two and a half hours back. We had a great day! This diatribe brings me to our Saturday drive to Lincoln. No plan, normal for us, and pretty much no idea that it would take over two hours to drive there as well. The place was heaving. Little did we know, and this is the major downfall of those “let’s go for an adventure on the spot” kind of plans, there was massive amounts of things going on in Lincoln that day. A food Market, an art expo and a “lets see how many cars we can get in one square foot” conference. Finding a car parking spot was a nightmare. Eventually we found a tiny patch of dying grass at the back of a car park and et voila. I wasn’t sure there was going to be a car there when we got back because the sign right next to my car said…..No Parking. Oh well, what’s the worse that can happen? Sarah and I have fallen in love with the Old Town of Lincoln. The architecture is beautiful and the food market, well. We had an Ostrich Burger…mmmm and because I am a greedy pig, a had an authentic Lincoln Samosa as desert! We wanted to go to the Cathedral and Castle but time was of the essence and we wanted to walk around the town and of course, have a coffee. It wasn’t that difficult to be honest but Sarah won’t let me relax until we have walked the obligatory 11,000 steps. There are many beverage establishments in the centre and we chose one at the top of the aptly named Steep Hill, and Christ’s Hospital Terrace. The Book Stop Café is situated under the Imperial Teas of Lincoln shop, which, if you like tea, is a great place to shop. The Café is not wheelchair accessible and to access it, you have to walk down a few steps. It was quite warm inside, both in character and temperature, but that may have been partly due to the climb up the aforementioned hill. The coffee and tea were served in china cups so very quaint but the tea was served in a stylish, modern tea pot. There are, unsurprisingly, a wide choice of teas and the coffee was nice and strong despite being decaf. Price wise, pretty much normal for todays Coffee provider. They sell books as well and that to me is a perfect combination. The staff were absolutely lovely but there was a big downside for me. They do not have their own toilet but there is a public one opposite and the waitress did say that if I did not have a 20p piece, they would be happy to provide one. I thought that was sweet but thank god I was not desperate. They are open 10am – 5pm every day. After the short break, we finished our walk and returned to the car park to discover the car was………….still there and what’s more no ticket…hurrah. Our trip around Suffolk was still continuing and as we neared the old Market Town of Woodbridge I swear I picked up the aromatic, fragrant, (I know that’s a Tautology but leave me alone, I’m trying to be poetic), smell, (it’s the best I can do), of freshly roasted coffee. I was probably imagining it but once I get that longing for a cup of java, I’ll make any old rubbish up. We were driving towards the train station and found the aptly named Station Road. I have a theory that most railway stations have a café, which turns out to be wrong, in my experience, about 50% of the time but nevertheless we were rewarded by a very pleasant find, the Whistle Stop Café. The café is what used to be the Woodbridge Railway Station and still looks like it. It is right next door to the Woodbridge station Guest House, for those who want to stay longer and the area has much to see. There is a carpark there that according to the Cafe’s website, costs £2.50 for 24 hours which is a bargain! The café can seat 34 inside but I suspect that will be a little cramped and outside there is seating for about 64, (but there is no shelter). We got there for an early lunch, which is good because it is popular. I chose a black filtered coffee, which as it turned out was a seriously good move because filtered coffee refills only cost 80p!! Sarah chose a Sauvignon Blanc…hmmm. They serve hot and cold food and we were happy with our paninis. They also have a range of speciality coffees should you wish. There is a toilet but it is downstairs, right next door to the kitchen and there are two steps up to the toilet itself. Not great for disabled I feel but perhaps there is an arrangement with the Guest House, who knows. After lunch, Sarah and I walked over the railway bridge and along the quay at Tidemill Yacht Harbour. It was a bit windy that day and Sarah inadvertently did her best impression of Marilyn Monroe as a gust took her dress to new heights! We had a wonderful, relaxing afternoon and prepared for our drive home. Our brief sojourn into Suffolk entices me to visit again, not only for the coffee, of course, but for the scenery and the people. As it turned out, about 4 months ago I had to go back to Suffolk for business. I didn’t know where I was and my Sat Nav was seriously having a laugh. I had finished my business, (man, that sounds wrong), and took a wrong turn, finding myself back at station road. I stopped and had a cappuccino and was again happy with my choice. But it didn’t feel quite right and then I realised why…..my Marilyn was not with me……. When we first thought of this blog I was about two years younger than I am now. I don’t know whether that’s called procrastination, laziness, forgetful or just slow but hey, we got there eventually. We re-thought about it about a year ago……anyway…. Sarah is what is known as a Suffolk Dumpling! She was born in a place called Halesworth, obviously in Suffolk. In August 2016 we decided to take a long weekend and visit Suffolk and check out her spiritual home. Halesworth is described as a charming market town in north east Suffolk, about ten miles inland from the Suffolk Heritage Coast. Halesworth railway station is on the East Suffolk line with connections to Norwich and London Liverpool Street so easy enough to get to. Halesworth Station still has moving platforms, although they are no longer in use. These swung to allow the passage of road traffic. Pretty impressive. I remember it was the 19th August. Nothing particularly interesting in that date…I just thought you should know . As we walked down the main shopping street, (Bridge street), the urge overcame me and we had to find coffee. We came across the Hideout Café. We sat in the picturesque bay window overlooking Bridge street and watched the world go by. The current owner had had the café since February 2016 and was making it her own. We got there relatively late and she normally closed at 4pm but didn’t chuck us out and even chatted about changes in the area, which of course were huge considering Sarah left there when she was a little girl. The worse thing was the hospital that Sarah was born in was closing down, (now there’s a shocker!) so as is often the case, locals would have to travel to bigger hospitals, further away. I suppose being a nurse and a great advocate for the NHS this is painful and we don’t even live there. The café had a relaxed atmosphere with sofas, outside tables and attractive décor. What was even nicer was that even though the café was now officially closed, the owner could not resist the fluttering eyes of a small girl looking through the door, intent on a chocolate cornflake cake. Local cafés can often be a central part of a community, or should be, and this was a clear reflection of that policy. Coffee tends to naturally be a double shot so be careful if you want a stronger cup! It also only came in one size but it was good. One thing my nearest and dearest knows is that I am obsessed with coffee. 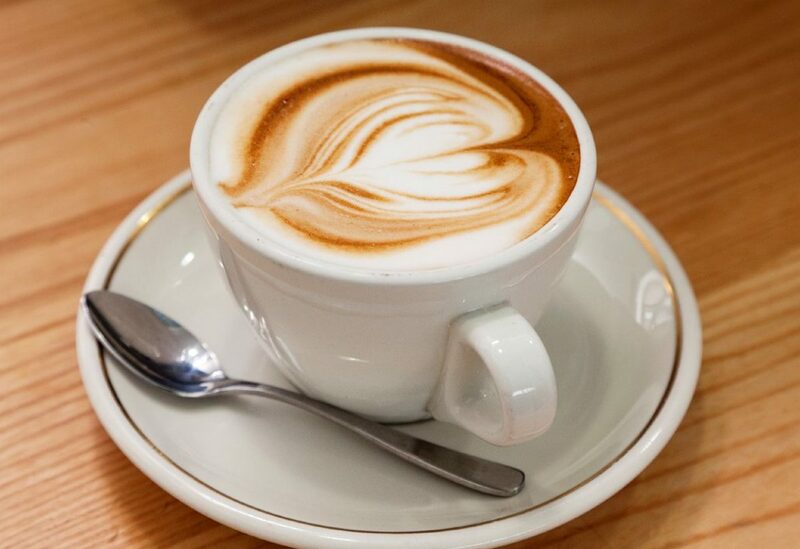 I prefer a smooth, strong cappuccino with a light dusting of chocolate on the top, drunk in the congenial atmosphere of a relaxing café or coffee house and preferably in the company of my wonderful wife. If she’s not free, a good book will do! The world as I know it is swarming with chains of tea houses and coffee houses so what I search for are the independents, the single café staffed by those with a passion for their art; but also staffed by individuals who don’t crack up when I ask for Decaf!! Yes, the world has kicked me in the proverbial knackers and I am limited to only a couple of full-fat coffees a day. So, why the blog? Sarah, the aforementioned missus, and I were sitting outside a small café in Edinburgh having a pleasant beverage when I had a eureka moment……why work when I can drink coffee!!!!! Apparently you have to work to be able to pay for the coffee. 2nd Eureka moment…write a book about coffee…..already done to death. 3rd and ultimately the last Eureka moment…….write a blog…..ta daaaa!!! So, the aim of this blog – go where no coffee blogger has been before, search the country far and wide for the finest coffee shop and tell the world. This is my 1st post so let’s hope it gets better. I will publish as often as possible, places where we have been with a personal grading system, (yet to be fully finalised but will involve coffee, accessibility and toilets….very important as I get older! ), so I can share the fun we have visiting beautiful places and drinking fine coffee, (or tea in Sarah’s case). I will improve the site as I go along so all ideas welcomed and if you know of a café or coffee spot that needs a visit let me know and we can add it to the ever growing list.